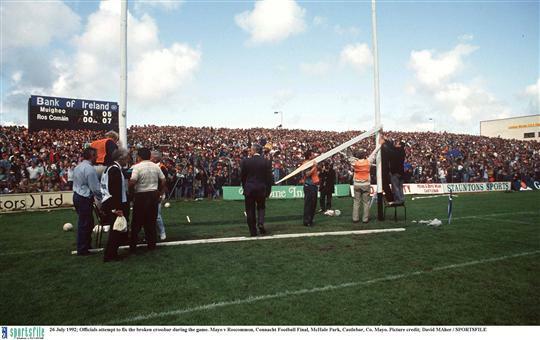 On July 26th, 1992 at McHale Park - just like 30 years previously in the Connacht final - the crossbar broke. In the 1962 final, Roscommon were six points down to Galway when their goalkeeper Aidan Brady split the woodwork. The lengthy delay which followed benefited the Rossies. They emerged victorious 3-7 to 2-9 after the switching of Gerry O'Malley to midfield proved a decisive move. 30 years later, it was again Roscommon in the Connacht decider, this time against Mayo. The breaking of the crossbar would not bring the same fortune for Roscommon. With the sides level at 1-4 to 0-7, Roscommon keeper Gay Sheerin saved a shot from Tony Finnerty. As the ball looped towards goal, bouncing off the top of the woodwork and then over for a point, cornerback Enon Gavin sensed the chance to prevent a score. Gavin - in many ways the Shaquille O'Neal of 90s GAA - jumped, grabbing onto the wooden beam, and instead of preventing a score, broke the goal. The delay which ensued remarkably lasted only seven minutes. Clearly the staff of McHale Park had learned from the experience of 1962. A new crossbar was quickly installed. Mayo went onto win the game 1-14 to 0-10. For the first time, that we've seen, video of the incident is now on YouTube - thanks to the great KillianM2.